One of the most ancient of roofing materials, tile has been used by many civilizations throughout history. With a variety of tile styles to choose from, tile complements everything from traditional to modern architecture. Create an authentic Spanish look, or go Mediterranean, historic or contemporary. Maintenance Free - Tile roofing products usually outlast the buildings they protect. Energy Efficient - Rooftops Tile Roofing systems can include support bars separating roof tile from the deck, reducing heat transfer and increasing thermal insulation. 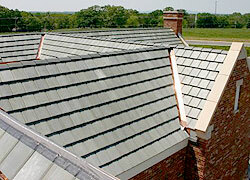 With the right ventilation, many of the tile roof options can even earn the Energy Star Partner stamp of approval. Lasts 50 - 100 year Life cycle - With the temperature extremes we experience in the Caribbean, tile roofing is a durable, attractive choice that weathers beautifully with time providing decades of beauty for your home. 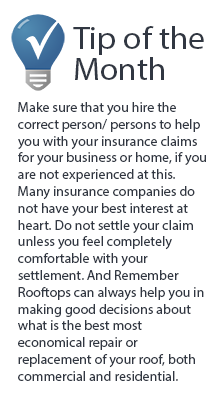 You can expect to add more than 50% of the value of the roof to your home instantly. Clay barrel tile is a beautiful roofing system. From Spain to Rome, roof tile has gained worldwide recognition for its symbolic strength and attractive Old World design. Combine that beauty with the strength of steel, and you get metal tile roofing. Rooftops offers metal roofing as a solution for durable and safe living in the Caribbean. This type of roof is able to stand up to the elements, including wind and rain, and is a non-combustible roofing choice. Durability - Metal roofing will last two to three times longer than a less expensive roofing materials. Metal coatings allow metal roofs to last longer than any other type of roof. A high-quality metal roof will likely be the last roof you'll ever need. Resistant to cracking, shrinking and eroding, metal roofs are fire resistant and hold up well in storms and heavy winds. Environmentally Friendly - All metal roofs are made from 30-60% recycled material reducing landfill waste. 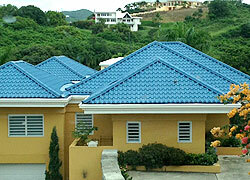 Today concrete tile roofs are gaining in popularity in the Caribbean. Energy efficiency, longer life cycle, and aesthetic appeal has made tile roofing the dominant choice for homeowners looking for an upgrade over other, more common roofing materials. 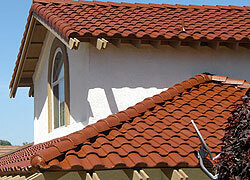 Some types of cement tiles can withstand wind gusts of up to 150 mph. Rooftops has discovered a new innovative structural concept for fabricating Bermuda Style roofing utilizing ultra-light foam core sheets coated with a cementitious outer layer and then sprayed with acrylic elastomeric coatings. This patented roofing technique is known as the “Pavi Panel” roof system. 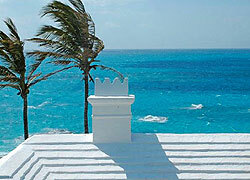 Attractive, sloping, layered Bermuda Roofing style – Standard roofing system used by the Bahamian government.